Essentials was a three-day intensive with a broad spectrum of people, from professional dancers to college students to working dance educators from New York, across the country (like myself), and the globe (Spain, Taiwan, Korea, to name three). We learned the philosophy of DEL, centered on developing a movement sentence of action words, which either stands alone or emerges from thematic content. From that point of departure, one layers on exploration through the Laban movement vocabulary and then further develops the material through choreographic tools. It’s very open-ended and student-centered. We looked at advocacy as well, because each of us needs an articulate and persuasive argument for why dance is so important in education. Advocacy promotes understanding and support, so vital to our existence and continuation. Early Childhood was a five-day workshop. We went in depth, developing a lesson and unit progression, writing our own unit and lesson progressions and sharing them, and learning more about child development and behavior management. I recommend these workshops. They pair nicely with the Laban concept-based approach of Anne Green Gilbert . If you are already familiar Anne’s lesson progression and brain-compatible work, you will find the DEL work to reveal another facet of dance pedagogy. Plus, you get to meet great people doing meaningful work in exciting New York City. I loved my time there. You can register for next summer’s classes after January. Tell ‘em Kate sent you! July 13, 2016. Tags: anne green gilbert, children's dance education, creative dance professional development, Dance Education Laboratory (DEL). Curriculum Integration, Lesson Plan Organization, Professional Development, Recommended Resources, Teaching Skills. 2 comments. You may not know about the National Dance Education Organization (NDEO). This organization has recently started offering on-line courses through the program they call the On-line Professional Development Institute (OPDI). Check out the link to see their summer and fall course offerings. Professor: Marty Sprague; Tuition $500; 3-NDEO endorsed CEUs; 10 weeks; 2 Undergraduate Credits available from University of North Carolina / Greensboro (UNCG course # DCE 245) for additional $300. In this course, participants will explore arts integration using the creative process as a method for developing movement and integrating dance with other academic subjects. Participants will work through the steps of the process, documenting their thinking throughout using process portfolio forms as well as creating original movement and choreography. Created movement and dances will be videotaped and posted on the private (secure) discussion board for instructor and peer feedback. Participants may use their own students OR work through the process as a solo. Participants follow a logical progression of movement activities increasing in complexity from inspiration and dance design to creation of an integrated project. Book required: Dance About Anything by Sprague, Scheff, & Mc-Greevy-Nichols. Dance for students with disabilities is a means for them to express and communicate feelings and ideas, collaborate with others and learn new movement possibilities. All students need opportunities to learn, create, perform and respond to dance in all its forms. Through this course educators will learn instructional strategies that successfully include students with disabilities in the P-12 dance program. The course also addresses legislation related to students with disabilities, current issues for inclusion, people first language, characteristics of different disabilities, Individual Education Plans (IEP), Assessment and Goal development, accessible learning environments, and content and teaching modifications for learning in dance education. Educators who teach in the P-12 schools, private studios, higher education, and community dance programs will find this course can assist them with the knowledge and learning experiences to provide meaningful dance education programs for students with disabilities. Check out the site. The application fee is reasonable if you are not an NDEO member. June 23, 2016. Tags: Arts Integration, creative dance professional development, Teaching Tips for Creative Dance. Curriculum Integration, Recommended Resources, Special Needs, Teaching Skills. 1 comment. As a Teaching Artist, I often had to generate dance ideas that connect with curriculum. I might brainstorm and partially group-write a script or poem with the kids and clean it up later as needed. Words that would guide the action. Many of my own creations have come out of this process. For a dance about the Water Cycle, see “Water Dance” by Thomas Locker as a terrific point of departure. You can excerpt material for spoken word. For music, I recommend the storm section of Beethoven’s Pastoral Symphony and Marimba Dances – 1 from Light in Darkness by Evelyn Glennie. I group-wrote, very often, an ocean dance with the students (use Aquarium from Carnival of the Animals as your soundtrack). For desert, you can glean from Diane Siebert’s book Mojave. This resource is very rhythm-centric but it’s a very cool blend with movement and VERY math strong. and Creative Dance for All Ages, 2nd edition (which came out last year, and includes some video and additional resources as downloads). Some of my documented integration lessons are in issues of Activate! Magazine. This is mainly for music teachers, but also includes some movement. You can back-order some issues of Volume 5 that include science-integrated activities for K-2 and companion strategies that go with them. If you have ideas of your own, kid-tested favorites, please share! June 14, 2016. Tags: AlphaBeat Lesson Ideas, anne green gilbert, creative dance and curriculum integration, Creative Dance for Children lesson ideas, creative dance lesson ideas, dance ideas for the classroom, Teaching dance to kids, Teaching Tips for Creative Dance. Creative Dance Lesson Plans, Curriculum Integration, Favorite Books, Favorite Music, Kate Kuper on Teaching Creative Dance, Teaching Tips, Thoughts on Teaching Series, Working with Kate's Material. 2 comments. This is the 5th post in my “Thoughts on Teaching” Series. I just completed a two-week residency with a group of 4th graders at a public elementary school in my town. This was a large (28) and diverse group. There were a lot of concentration problems. Some were ‘too cool for school’ and their self-consciousness distracted them. Here were a few issues that came up. Boy, does this one come up in every day life! It can be very frustrating when one of two children (paired by their classroom teacher rather than self-selected) digs in and says, “he won’t do anything” about his partner. For us, patience is a virtue. Try several points of entry, and remember that tomorrow is a new day. 1) “Show me what you’ve got.” I just ask them to show me anything and use it as a catalyst to build. 3) “Take a break.” One person may be unable to work that day. Let her sit out, while the compliant student creates. The next day, they may be able to work together and there will be material to start from. What’s the point of teaching if you cover the material but the material does not cover the child? 1) “If you can hear me, put your hands on your __________” (head, shoulders, etc.) A quick scan around the room tells you who was tuned out. 2) Have them show (or tell) you. SHOW – When you review what you’ve just presented, have the group raise their hands when they hear the cue (or whatever the content is you are trying to impress upon them). TELL – If you call on the students who know, you’ll still have the space cadets floating out there. So ask the space cadets instead. Sometimes I will tell specific students that I will be calling on them immediately after I give the instruction, and they will have to repeat the key point. 3) Break it into chunks. Smaller bits are easier to digest. When students create and then perform their dances with no energy, apathetically, with small and cramped movements, and a sense of embarrassment, they need coaching. 1) Show 2 ways – Demonstrate the self-conscious, boring way and the energized, committed way. 2) Make it bigger! Dances often ‘shrink’ in energy and size. Get everyone on his or her feet and have the students experience a big kinesphere of space, reaching in all directions. This gets the blood flowing and serves as a ‘reset’ too. Then, when they return to their dances, use the kinesphere image for overall size and energy. 3) It’s yours. Remind students that these are their creations. Own it! May 23, 2016. Tags: Behavior Management in the Music Classroom, children's dance education, Movement in Elementary Music, Teaching dance to kids, Teaching Tips for Creative Dance. Behavior Management, Kate Kuper on Teaching Creative Dance, Special Needs, Teaching Skills, Teaching Tips, Thoughts on Teaching Series. Leave a comment. I’m so excited to share the news that my dance and science integrated curriculum book has just been published. Fantastic Forces is a book, CD and DVD combination, designed like Songs for Dancing and Step on the Beat. It’s based on an evolving unit of study I first experimented with in 2000 and have revised and improved over many dance residencies, primarily with 3rd grade classes. I created songs and rhythmic speech music, with long-time collaborators Neal Robinson and Rocky Maffit, and documented demonstration teaching with long-time video collaborator Bill Yauch. To give teachers a nice broad plank of science understanding, I also collaborated with Troy Vogel, a science professor at the University of Illinois. He kept my ‘magical thinking’ at bay, and his explanations appear throughout the book as “science corners” to enhance understanding. The material is a big unit of study, integrating music, movement, and all the integration strategies I use so that students can gain understanding through multiple points of entry – seeing, hearing, saying and doing. There are many opportunities for students to problem solve in pairs, adding the collaboration component to critical thinking. My hope is that music, classroom and physical education, and dance/drama teachers can even work together to implement the material. You can order your copy directly from the publisher. I’m also available for professional development workshops to help ignite and launch teachers in implementing the curriculum. May 17, 2016. 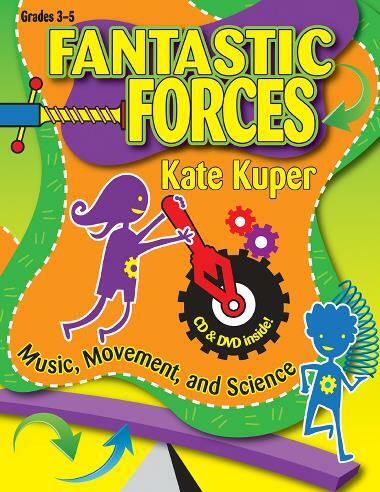 Tags: Arts Integration, creative dance professional development, dance and science, Fantastic Forces, Kate Kuper Books and Music, movement and science, Movement in Elementary Music, science and dance. Creative Dance Lesson Plans, Favorite Books, Kate Kuper on Teaching Creative Dance, Working with Kate's Material. 1 comment. These descriptions were a light bulb moment for me in thinking about creative dance compared to studio techniques, and the way we explain them to others. The objective in most studio training, as in the description of theater above, is to polish and perfect in order to perform. Many hours of training go into “working and re-working the same material with the goal of performing it perfectly for an audience.” Striving for technical excellence sometimes obscures the reason that many of us were drawn to dance in the first place, namely for the feeling of freedom and joy that we get from moving. Whenever we are called upon to stand up for the value of creative dance in a studio setting, it is worth remembering – and helping studio parents and administrators to understand – the ‘process’ nature of creative dance and its importance in a well-rounded dance education. Creative dance provides a lab, an incubator, for improvisation, problem solving, invention, collaboration and critical thinking. Through it we learn the language of dance, dance making, and dance appreciation. While we may choose to polish and share what we create, ‘process’ is at the top of the list. Ultimately, we can bring the versatile skills of creative dance to the study of ALL techniques to help us become better choreographers and more expressive dancers. May 6, 2016. Tags: children's dance education. Studio Teaching, Thoughts on Teaching Series. Leave a comment. We just had our Informance – ‘informal performance’ – which we also call ‘Stay Day’ or ‘Open Class.’ We invite parents, family members, and friends to come, watch, take pictures or video, and best of all – PARTICIPATE! This is the only class where parents can see what a typical class looks like. Otherwise, we are closed to observation. In the fall, Creative Dance is a mentoring program for college students learning to teach, so we have several people sharing leadership during the lesson. My role is to narrate the rationale behind each section and to lead the final closure activities. In the spring, I teach with one assistant only, and we trade leadership throughout. I continue to narrate before each lesson component. I asked my students to come up with a “To Do” list that would help them plan future open classes. At the beginning of the semester, include information about the Open Class. Two weeks before, remind parents about the upcoming informance/open class. The week before, post signs and send out an email reminder. Print out business cards or flier promoting the class for the next semester and for referrals. Throughout the semester, track favorites activities from the lesson for Exploring the Concept, Developing Skills, and Creating. Select from among those favorites to write lesson plans, keeping in mind the possibility of parent participation. Make sure the lesson plan is very complete. Divide up lesson sections among teachers and assistants. Practice parts thoroughly so as to be competent and relaxed in front of the parents. Have a prepared introduction. This includes introducing all teachers and assistants and a brief summary of the concepts that we’ve worked on during the semester. Have a prepared short description of the whole lesson structure, with specifics presented before each activity (including the rationale for each component). Integrate remarks into the lesson plan so all teachers and assistants know what’s coming, to help with class flow and a sense of community. Have a sign when the parents walk in saying “Welcome Dancers and Families” as one last reminder, and to welcome them into our classroom. Have props and materials all ready set to the side, easy to find. Have the concept on the board written clear and large so all can see. Have music on a playlist, organized, easy to find. Watch the clock or have a timekeeper to keep us on track. Keep inviting parents and family members to participate throughout the class. Make closing remarks, at which time you can get promo into parents’ hands. Follow that with a fun, communal closing activity that includes everyone, and ends with the children and teachers organized for a group photo. Have parents help clean up. November 19, 2015. Tags: children's dance recitals, creative dance lesson ideas for an open house, informal children' dance performances, informal performances, informance, parent involvement, recitals, Teaching Tips for Creative Dance. Recitals, Studio Teaching, Teaching Tips, Working with Kate's Material. Leave a comment.